Do you remember how we kept telling you to be specific in filing your LD-2 forms? Someone didn’t take our advice, and for their pains, they got a nice little write-up by Politico and the Center for Public Integrity. 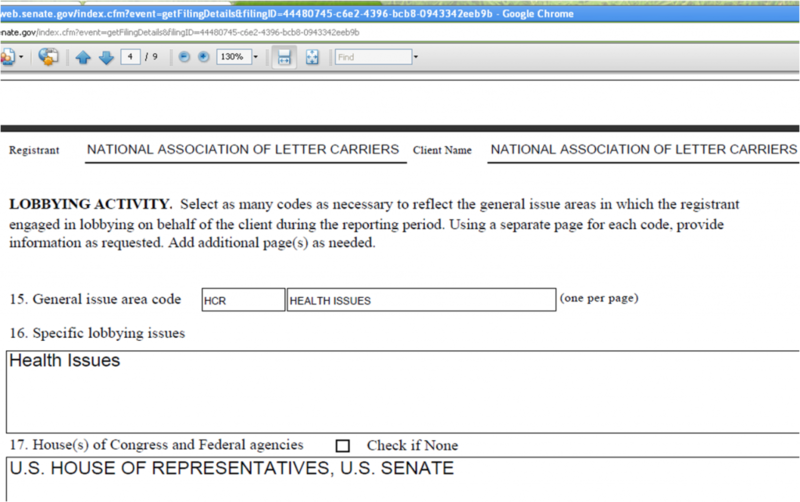 ﻿The screenshot below is not acceptable filing, because on Line 16, they entered “health issues” as their “specific” lobbying issue. “Health issues” is not specific. Stating specific bill numbers and titles is specific. (E.g. “HR 1234, a bill to modify the appropriations process for Medicare/Medicaid, provisions regarding funding for federal employees”…). You don’t even have to state which side of the issue you fall on. Unfortunately, their LDA filing is full of these under-disclosures. While we tend to find these incorrect filings mildly humorous over here at Lobby Blog, the fact remains that this is not funny. The law requires that you file completely and correctly. Even a cursory glance at the requirements can solve these problems. Don’t open yourself up for embarrassing and costly investigations. Follow the law. Everyone will be happier. I sat down for a chat with lobbying law expert Cleta Mitchell a few weeks ago. We were discussing, among other things, the upcoming 2010 Edition of the Lobbying Compliance Handbook. Cleta has a passion for accurate, thorough information. She’s right – it is foolish to overdisclose and illegal to underdisclose. The solution to that problem is to completely and accurately follow what the law requires – which (among other things) is: full disclosure of lobbying clients, the issues upon which you’re lobbying (be thorough!) and amount of money that you’re earning to speak on behalf of your clients. Why not take a moment to brush up on what the law requires? The payoff is knowing that you’re completely in line with the law. There is plenty of room within this model for good-government groups and ethics watchdogs (and lobbyists themselves, of course) to suggest improvements and changes in the information that is disclosed. That’s a good thing – a citizen-governed nation requires a lot of oversight and maintenance. But don’t assume that disclosure for disclosure’s sake is necessarily a good thing. As a lobbyist, you should already be maintaining a high regard for the facts – and a commitment to passing them along truthfully.